Chinese Chess or Xiang-Qi is a considerably modified form of Shatranj, the first reference of which has been found in a book called 'The Book of Marvels' by Nui Seng-ju who died in 847 AD. 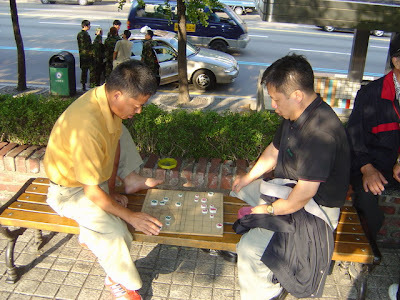 Changgi or Korean Chess is similar to Chess in China. 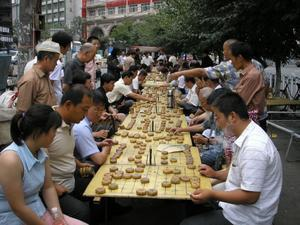 The board omits the river of Chinese Chess and some of the moves are slightly different but probably the most significant difference is that players can "pass" their go if they wish. One effect of this is to slightly increase the chances of a draw since when one player is reduced to a lone King, repeated passing forces a drawn game. Makruk or Thai Chess is presently thriving well in its home country where proponents outnumber those who play European Chess by a huge proportion and the game is a nationally televised attraction. The origin of Makruk is simple "Mac" means game in Thai and "Ruk" comes from the Cambodian "Ruk" or "Ouk" which means chess. 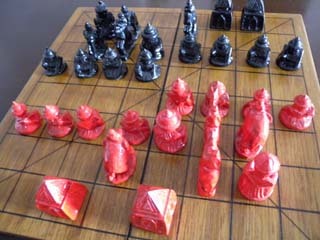 Makruk is played in Cambodia as well as Thailand, although this country sports yet another historical variant - Cambodian Chess. 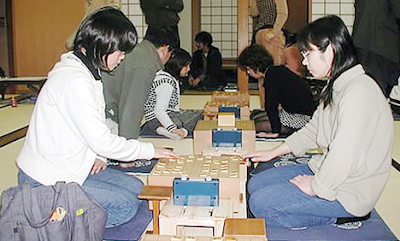 The game is related to both the Japanese and Burmese versions of Chess and many people believe that Makruk predates both these other games. 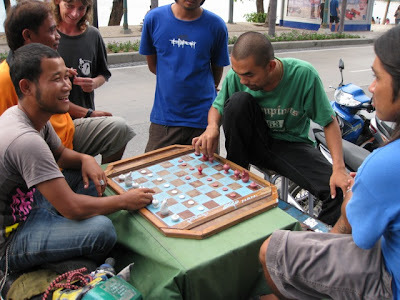 Malay chess or Main Chator, is played in Indonesia, Malay islands and peninsula and the Philipines. Main Chator is believed to come from Indian chess but was later heavily influenced by the Dutch. Main Chator now looks a lot like European chess, but there are still many different rules, like the promotion rule which is very complicated. 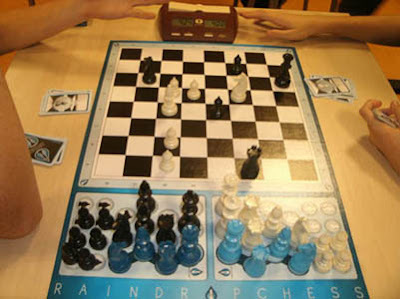 Raindrop chess was introduced in 2009 in the Netherlands. The game begins with an empty board, the chessmen are waiting on marked areas next to the board. At the start of the game, all squares on the chess board may be occupied freely. White is first to draw a card. The chessman displayed on that card may now be placed anywhere on the board. The players draw a card in turn. Drawn cards are put aside and made into a pile with displayed pictures upwards. One by one they appear on the board. Raindropchess differentiates between ‘Raindrop moves’ and (ordinary) ‘chess moves’. Chess moves are only permitted when a player’s own King has been placed on the board. That player will hence have a choice: make a raindrop move or a chess move (with a chessman that is already on the board).